It reminded me of a similar event that happened to me back in 1997, long before Narrative and in a time when mobile phones were still getting smaller. Back then I was designing and running motion graphics on the set of the James Bond film Tomorrow Never Dies and one scene required a particular image to appear: a sinocentric image of the Earth (with China in the middle). It was the days before before broadband so I had been scouring NASA’s website over an 128Kbps ISDN connection (about 100th the speed of today’s most basic domestic broadband); it was taking ages and I was getting increasingly frustrated as I couldn’t find quite the right photograph. In my rage I turned to the person next to me and was just about to launch into a resentful tirade but, as the words formed in my mind, the reality of what I was trying to do dawned on me. What I was doing was incredible. A mere single generation before it would have been sci-fi fantasy but here I was, looking on a global network of computers, for a specific photograph of the planet Earth, that had been taking from a spaceship, floating in outer space… And moaning that I couldn’t get find the right picture. I was, looking on a global network of computers, for a specific photograph of the planet Earth, that had been taking from a spaceship, floating in outer space… And moaning that I couldn’t get find the right picture. Talk about first world problems! It is so easy to fall into the trap of thinking that modern life is rubbish but, with all the information and connectivity at our disposal these days, it’s more important than ever to step back occasionally and remember what amazing times we live in. 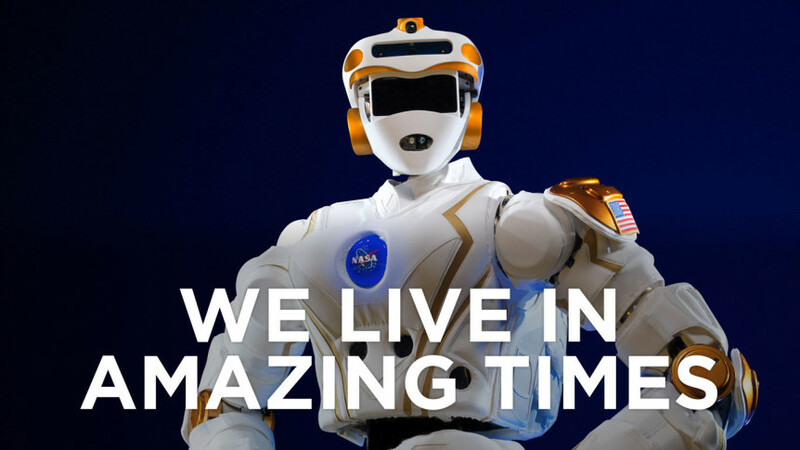 image: NASA’s R5 Space Exploration Robot.